3M™ PELTOR™ ComTac™ VI has new omni-directional microphones, high fidelity speakers, and a new digital signal processor that improve the overall sound quality of the headset. 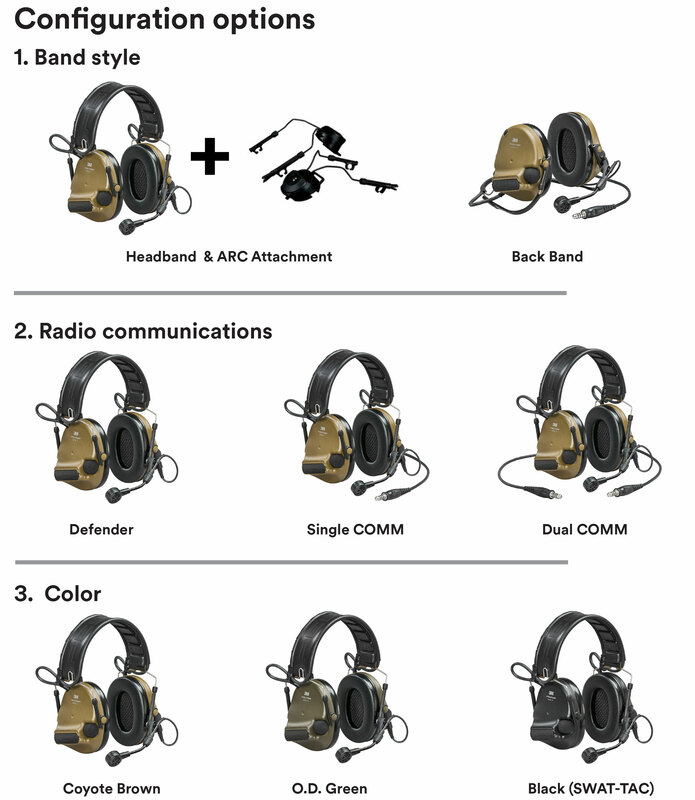 These improvements result in a more natural sounding headset with sound and voice clarity designed for combat and combat support operations in complex acoustical environments. The transmit microphone has been redesigned and embedded with patented 3M close cell foam and delivers improved noise cancelling transmission in high noise and wind while also improving dust and water ingress protection. The environmental listening feature, also known as “talk-through” is a means of allowing safe audio sounds to bypass the individual hearing protection electronically while still helping protect against harmful noises. This is accomplished with 3M’s proprietary digital audio circuit integrated into the headset. A microphone receives the sounds outside the headset and transmits them to a speaker inside the headset. The level-dependent digital audio circuit senses noise levels above the desired threshold and compresses them to a safe decibel level or amplifies weak sounds to an audible level. Sound detection. All important components of auditory situational awareness, impacting Warfighter efficiency and safety. 3M™ PELTOR™ ComTac™ VI environmental listening function has been greatly improved by incorporating new omni-directional microphones and high fidelity speakers that can pick up sounds with great sensitivity and help replicate sound more clearly and accurately. Additionally, the new digital signal processing circuitry and new transmit microphone help improve speech intelligibility and the environmental listening function’s ability to detect and locate sound from previous generations of the platform. The 3M™ PELTOR™ ComTac™ VI offers a new way to adjust the auditory settings of your headset for your mission. Traditionally, a headset has a set frequency response, and the operator can only increase or decrease the volume. The MAP function provides new advanced ambient listening modes that allow access to a variety of gain settings, but with frequency shaping, to enhance auditory performance in five conditions. The MAP Profiles have been designed with a variety of combat and combat support operations in mind. Observation Highest volume and widest frequency response to maximize hearing when the user is still (overwatch, hide spot, stop to listen, etc). How does the Natural Interaction Behavior "NIB function works.